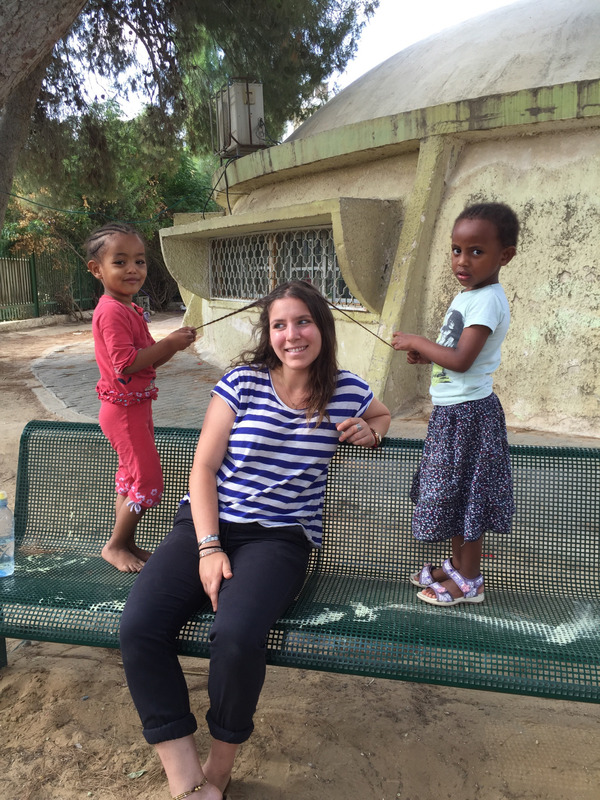 This post was written by a Jordana Gilman, a Yahel participant on the Repair the World Onward Israel participant who is volunteering in Be’er Sheva at a women’s shelter. I was always taught not to see things in terms of black and white. (I hesitate to use the expression now, but:) the “right” way to take in experiences and observations was to remember that everything comes inshades of grey. I was taught that the world is “complex,” and that my linear mind needed to bend and weave in order to fully appreciate the many perspectives that combine to create this thing called reality. I was reminded that there are many truths. But this past Thursday, my world turned black and white. On Thursday, I took a trip to Tel Aviv with my program. 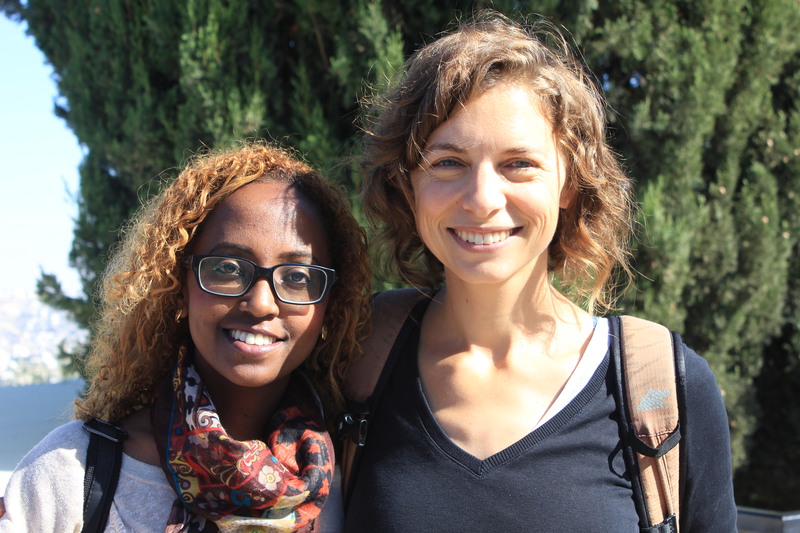 First, we met with the founder of Microfy, a micro-finance NGO that gives small loans to asylum seekers in Israel. These people are not granted refugee status–they are fleeing their homes in Eritrea, Sudan, and some other countries in Africa. They travel through Egypt and the Sinai at great risk to their personal safety to arrive in Israel. There are currently about 60,000 asylum seekers living in Israel, mainly in South Tel Aviv. Most are men. I have been to South Tel Aviv a few times before because that’s where the central bus station is located. I had always been told that it’s “a bad area” and that I should go straight to my bus. So that’s what I did. On Thursday, though, we weren’t there to go somewhere else. We were there to see South Tel Aviv, the Black City. 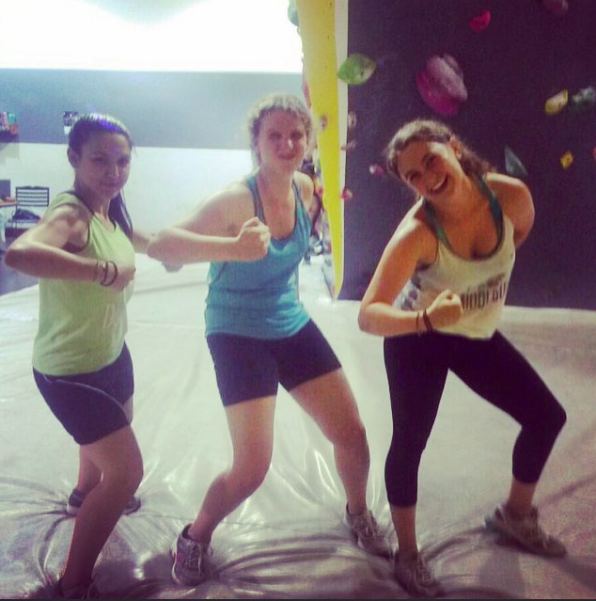 Our visit to Microfy was inspiring. I was feeling pretty good about the situation. The founder is an incredibly engaging and powerful woman from Uruguay. 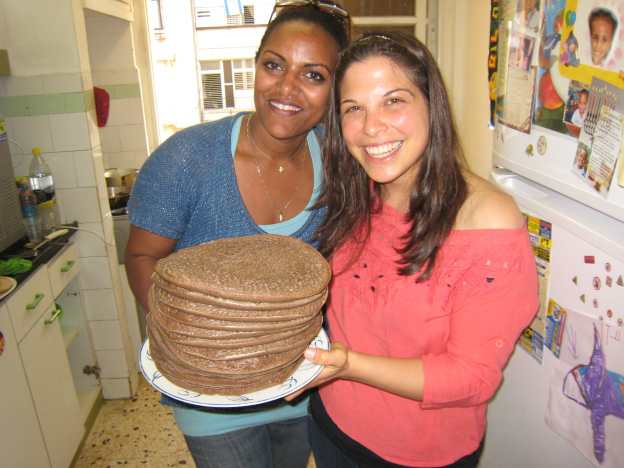 She said she was overwhelmed by the poverty in Uruguay but felt empowered to make a change here in Israel, and she made alliyah several years ago and hasn’t stopped changing the world since. They have given out 120 micro loans, all of which have been repaid in full, with 10% interest. 120 isn’t many out of 60,000, but you have to start somewhere, right? After Microfy and lunch on Florentine, an “up and coming” area of South Tel Aviv, we met with a Mizrachi feminist woman, founder of Achoti. This NGO focuses on bringing Mizrachi feminist issues into the spotlight. We often talk about the minorities in Israel: Palestinians, Bedouins, Druze, and other non-Jewish groups. There is a forgotten group though, the Mizrachi Jews. They are invisible to the “Ashkenaz Smol,” or the “White Left” (this phrase also doubles to mean “White Small” to highlight the close mindedness of proud left-wing Ashkenazic Jews who refuse to acknowledge the plight of the Mizrachi population). The Mizrachi Jews mainly live in South Tel Aviv and the periphery of Israel. It was a little awkward for me to hear about this woman’s life and her fight for equality: I am Ashkenazic, I am left-wing, and until this past Thursday, I did not understand the difficulties facing Mizrachi women. At this point, things were still under control. We had met with strong, capable women who had founded successful NGOs that were helping the community. We were exploring the Black City, and it was diverse, it was exotic. We even walked through one neighborhood whose streets are shaped like a menorah (Neve She’anan). But then it was sad. We toured the lower floors of the Central Bus Station, the floors where I would never venture on my own. There is a market on these floors, crowded with cheap items and somewhat deserted of potential buyers. We traipsed through this scene as a group of 18 white American young adults. We didn’t belong. It was obvious and embarrassing. The bus station led us to Levinsky Park. From far away, it looks like a colorful children’s playground. As you get closer, you notice that there are blankets and cardboard boxes in the slide entrance. There are people living in the red plastic tunnel that connects the monkey bars to the fireman’s pole. And what at first seems like people sunning themselves on a grassy lawn turns out to be about 50 young African men, asylum seekers (or “infiltrators” as they are often called in Israel), living on the ground. They were using boots as pillows. We spoke to a man from Eritrea who escaped about 2 years ago. The program had arranged this for us, and he met us at the park. 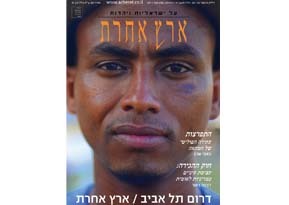 He was featured on the cover of a magazine in Israel, Eretz Acheret (“a different country”–the magazine article is about South Tel Aviv, which is a whole other country from what most Israelis know and love). He told us of his journey through Sudan and the Sinai. He was lucky to not be kidnapped and held for ransom by Bedouins. He told us that in Eritrea, he’s not allowed to express his political opinions. He risked his life time and again to come to Israel, where he has no working permit, no official status. Now he works in a hotel. He’s one of the lucky ones. Israel only has an immigration policy for Jews. There is literally no immigration policy whatsoever for non-Jews. After this, we spent the next hour and a half in a nearly abandoned, dark hallway of the Central Bus Station unpacking what we had seen that day. My roommate and dear friend is making alliyah this coming year. She went on Nativ a few years after I did and she has decided to come to Israel as a lone soldier. She grew up attending a socialist Zionist summer camp. She is one of the smartest people I know, and she loves Israel with everything that she is. But Thursday tested her faith and her love. She broke down in that horrible hallway of the bus station. She said that she finally saw what people were talking about when they equated Zionism with racism. She said that she couldn’t believe that people were living this way in this beautiful country. Her pain was my pain. This was the hardest moment of the entire trip. Nothing much was resolved, but the schedule for the day was over, and we were let out into the wild of South Tel Aviv. Our first independent action of the day was to get on a bus headed to North Tel Aviv, the White City. It took us a lot of time to wind down from what we had experienced. We powwowed over dinner at a lovely Italian place by the Carmelit market. Our critiques and our commitments were intertwined. We agreed in a general sense that what we had seen that day would inspire us to action. Either we would take the opposite route of the Uruguayan goddess and combat these issues in our own home country, or we would commit to returning to Israel in some capacity to be part of a sustainable change to help here. We shopped a bit and met up with friends. After a bit of walking and waiting, we hopped on a bus to take us to Herzliya, where we would stay for the next 48 hours. We were welcomed with open arms by one of the founding families of Herzliya. We stayed in a gorgeous house in a perfect neighborhood. There was a stocked refrigerator and air conditioning and even a mommy ready and waiting to help us with anything we needed. 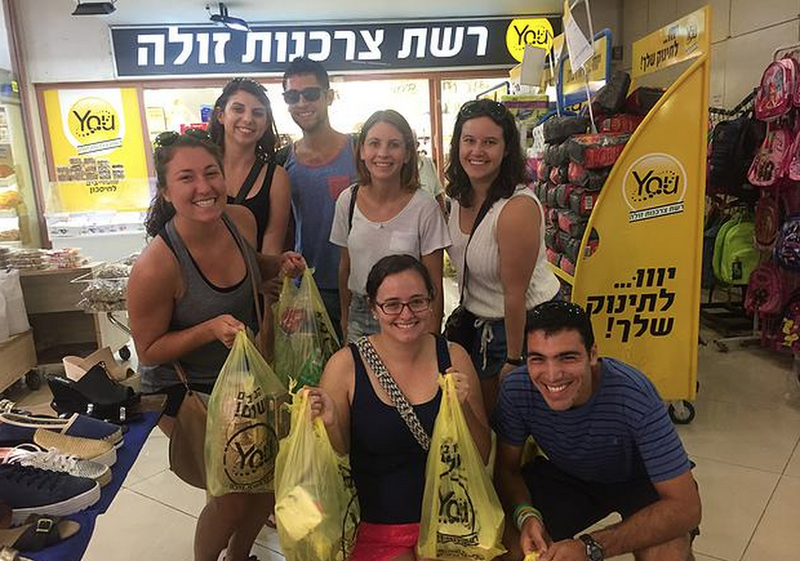 The next day, I went into Tel Aviv again with Ariel to check out the shuk, stroll through Nachalat Binyamin (an artist’s market), walk on the beach, and shop on Dizengoff. We watched beautiful people walk the streets in skimpy bathing suits. Couples kissed passionately on sidewalks. Music and the faint, sweet smell of hash drifted in and out. People greeted each other with a secular cry of “Shabbat Shalom!” Shiny happy Jews holding hands. When I told my mom my location, she texted me back: “What’s up in the White City! ?” She had no idea what that statement would mean for me; it affirmed my position in Israeli society and reminded me of the inhabitants of the Black City, just a short city bus ride south of where I was eating falafel and taking in the sites and sounds of the lively White City. Our Shabbat in Herzliya was magical…we had a delicious dinner at home, got dolled up and crashed a birthday party, hung out at an American sports bar with live music, and went to a nearby club. The club was our taste of diversity for the evening: there was a wide variety of colors and sexualities represented there. A friendly (probably) Ethiopian (definitely) lesbian woman made sure I didn’t forget that. Saturday was pure luxury: sleeping in, playing at the beach, and an easy bus ride back home to Be’er Sheva. I needed the relaxation, but every time I thought about “deserving a break” I was nearly eaten alive by privilege guilt. The words and melody of this song came back to me, though I haven’t thought about this song in years. In 2008, I didn’t “agree” with this song. I have another country. It’s called America. As of today, five years later, I have spent three summers and one school year in Israel. I have learned to love this country in ways I never thought it was possible to love a country. I have also struggled deeply with the problems here. I have defended Israel and I have been painfully disappointed by Israel. My experiences are layered like a tel–a hill created by many generations of people living and rebuilding on the same spot. Each new visit adds on top of the old ones, pushing them deeper into the ground but not erasing them. It takes some disturbance or digging to bring these old feelings and memories to the surface, but it’s all still there. My 17 year old self is walking the streets of Jerusalem just as my 22 year old present self is crying on the floor of the South Tel Aviv central bus station, just as my 19 year old self is taking a shower in a moldy bathroom in Yerucham. America is my country, that is certain. I am excited to be returning there for so many reasons. But through the pain and the confusion, I feel a passionate love for this land, this homeland. A word of Hebrew heard on the street in New York City pierces my soul. With a painful body and a hungry heart, here is my home.